Sang Hoon Kim’s Sofa Set, 2018. In furniture design, foam is typically only considered the end of the story, mostly used in packaging, ignored and unloved. It is a bit player—a necessary nuisance cut into planks to buffer, formed into precision-cut cradles, or poured on as so many peanuts filling negative space to ensure safe transit and then discarded. This is why Sang Hoon Kim’s recent designs, made entirely of foam, feel like such a revelation. Kim’s collection of seating, slab tables, sloping Swiss cheese bookcases and gelatinous-looking ottomans are made from a flexible foam, chemically treated so it becomes yielding and exceptionally dense. Some of these pieces—like geometric sectionals tinted in neat color blocking that recall hard-edge abstract paintings—are more well-behaved than others, such as the oblong chaises that look like they tried to knock over a Janovic. They all share a drippy, rough-hewn surface texture, making them look like something accreted in a cavern’s damp darkness over eons, or hurtled many light years to reach us (Kim refers to the bulbous ottomans, which come in a ghostly white or a tourmaline black, as “meteorites”). Eight of Kim’s foam pieces are on view with Cristina Grajales Gallery at Design Miami/ in December, the first time they’ll be presented in the US. Grajales, whose gallery is based in New York, was so enchanted with Kim’s work that she agreed to show it, nearly sight unseen, soon after he emailed her a proposal over the summer. She will meet Kim, who is based in Seoul, for the first time in December. 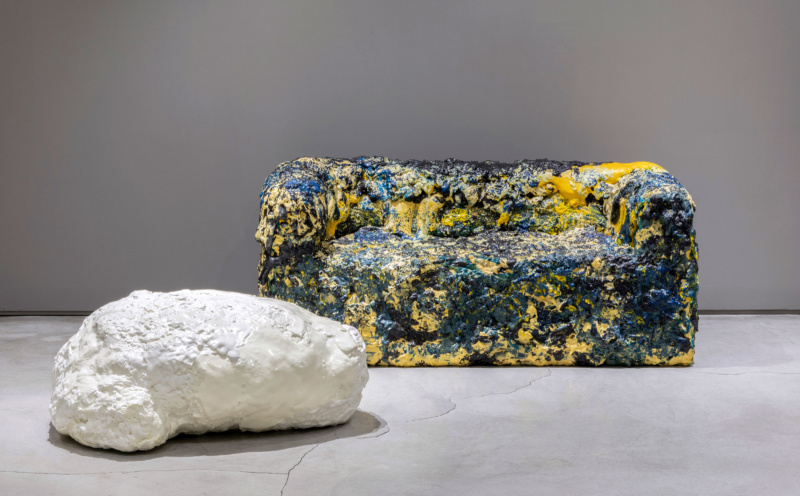 Foam Sofa, 2 Seat and Meteorite, 2018. Courtesy of Cristina Grajales. The pieces feel new, but for Kim, they have been gestating for years. His family has operated a foam factory in South Korea for three generations, and his exploration of the material’s possibilities is rooted in a childhood fascination. The collection is the result of three years of research in flexible foam, a material which already has a wide application, appearing in medical-grade artificial skin, but also artificial leather, and now legion memory foam mattresses.